Natural gas prices and gas-exposed stock prices on both sides of the border came alive last week. Natural gas gained 8.40 per cent to $2.84 per MBtu. The S&P/TSX Energy Index added 5.0 per cent, led by stocks that generate most of their cash flow and earnings from natural gas. The first snow storm of the season in the northern U.S and southern Canada sparked those gains. Last week's storm could be the first of a series of colder and wetter weather events this winter, a condition that favours natural gas and gas-exposed stocks. Long-term weather forecasts for this winter, recently released by the U.S. government, call for a La Nina. Winter temperatures during a La Nina are colder than average and snow fall is above average in the northern half of North America. As a result, demand for natural gas is expected to increase significantly in some of North America's highest population areas. Read more about La Nina at the National Oceanic and Atmopsheric Administration. Technical action by gas-exposed stocks and related ETFs has been encouraging recently. Most are already in intermediate uptrends and recently began to outperform the S&P 500 Index and the TSX Composite Index. Seasonal influences also are positive at this time of year. 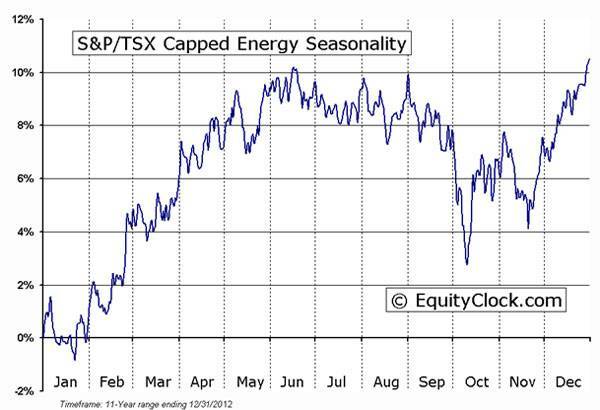 Normally, the S&P/TSX Energy Index reaches a seasonal bottom in the third week in November, moves higher into early January, trades sideways to the end of January and records its biggest gains into early May. This year, due to the La Nina weather effect, seasonal patterns are appearing earlier than usual. Better earnings and cash flow reports from gas-exposed companies will also help stock prices. Year-over-year results will show strong gains compared to Q4 2015, when natural gas prices averaged less than $2.00 per MBtu. Investors have a variety of ways to invest in the "gassy" equity sector. Examples of Canadian "gassy" stocks include Encana (ECA-T), Painted Pony (PPY-T), Canadian Natural Resources (CNQ-T), Vermillion (VET-T), Enerplus (ERF-T) and Bonavista (BNP-T). Among Canadian ETFs, BMO Junior Gas ETF (ZJN-T) fits the profile. Top ETF pick in the U.S. is First Trust Revere Natural Gas ETF (FCG-T). Don and Jon Vialoux are authors of free daily reports on equity markets, sectors, commodities, and Exchange-Traded Funds. Daily reports are available at TimingTheMarket.ca and EquityClock.com. The enclosed report is for information only. It should not be considered as advice to purchase or to sell mentioned securities. Data offered in this report is believed to be accurate, but is not guaranteed.